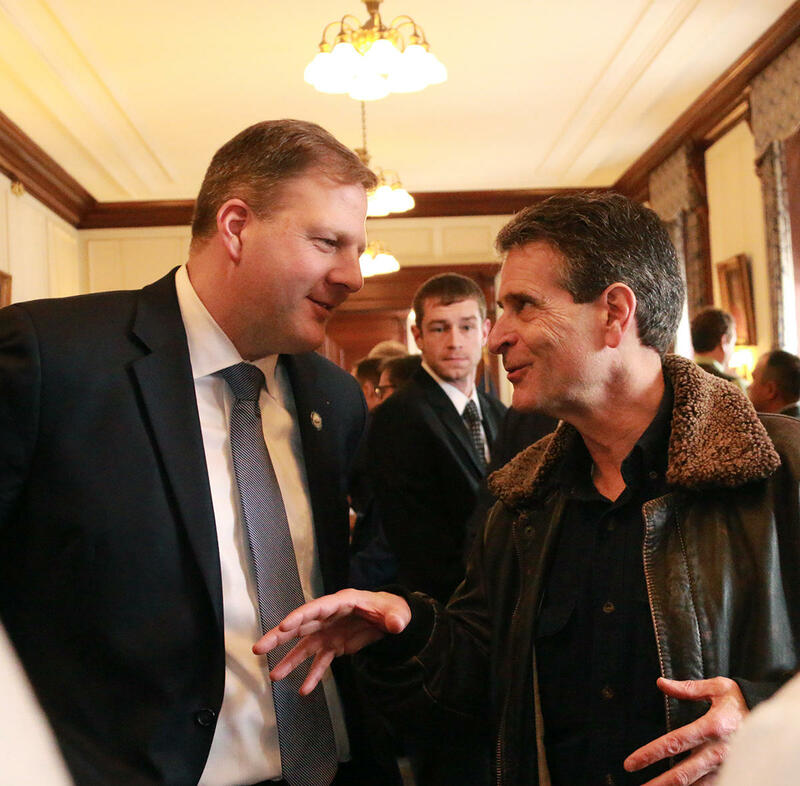 Governor Chris Sununu chats with inventor Dean Kamen after the governor's State of the State address in February, 2018. Governor Chris Sununu is in Dubai this week, but his office is keeping the details of what he is doing there under wraps for now. Sununu's office announced the governor's trip to Dubai with New Hampshire inventor Dean Kamen earlier this week, and neither the Governor's office nor Kamen's office are willing to provide much detail about the duo's plans while there. According to the Governor's office, Sununu and Kamen are traveling at the invitation of the Crown Prince of Dubai. They are also expected to make an announcement about the FIRST Global robotics competition. The Governor's office says Sununu is traveling without staff or any other state official, and that his trip is being paid for by the World Government Summit, which was founded by the ruler of Dubai. That summit kicks off Sunday and speakers include Pakistan's Prime Minster Imram Khan, International Monetary Fund director Christine Legarde and Motivational guru Tony Robbins. According to a spokesman for the governor, Sununu will attend a precursor meeting on global inequality featuring "government leaders and private-sector entrepreneurs." The Governor's office declined to provide further detail, but said it plans to provide more information on the Governor's trip when he returns to New Hampshire next week. Governor Chris Sununu is heading to Dubai on Wednesday with New Hampshire inventor Dean Kamen. Sununu and Kamen will be making an announcement regarding Kamen's FIRST Robotics program. While in Dubai, Sununu is also slated to attend an event exploring the rise of global inequality. The meeting is being convened by the World Government Summit, a group affiliated with the United Nations and World Bank. The same group is paying for Sununu's trip, according to a spokesman for the governor. New Hampshire Republicans had a brutally honest conversation this weekend about the state party’s dysfunction, and how it led to being “outspent, out-organized and out-messaged” by Democrats in the midterm elections. Governor Chris Sununu says he'll likely unveil his plan to establish a secure psychiatric unit outside of the state prison when he proposes his state budget next month. For 30 years the state's only secure psychiatric unit has been at the state prison, which means patients needing secure treatment from the state, have had to get it, behind prison walls.